The trimaran, or stabilized monohull is based on a long slender centre bull, with two side hulls providing lateral stability. Investigative work into the trimaran concept commenced at NWBS in October 1997 with a detailed numerical investigation into hull resistance by the University of New South Wales (Doctors 1997). From an initial 6 basic hull forms, a further 82 scaled variants were produced. These were analysed at 4 different displacements through a speed range equivalent to a full scale speed of 10-58 knots. Through this process a total of 3848 resistance points were created. The study defined the design parameters and the generation of hull lines to take forward into model testing in a trimaran hull configuration. In excess of 200 runs were conducted in the towing tank with the objective to identify the key parameters effecting hull resistance in the tri-hull arrangement. In these tests various longitudinal, transverse and vertical positions of the side hulls with respect to the centre hull were investigated, over a range of displacements and speeds. All of the testing and calculations to this stage highlighted that the side hulls contributed a disproportionate amount of drag compared to the volume they carried. Subject to stability performance, the results indicated that the side hulls needed to be as small as possible from a resistance perspective. Suitably encouraged with the results so far, NWBS built an 11m. 1/5 scale self-propelled manned model. This model was constructed with removable side hulls to allow assessment of different side hull designs and positions. The first series of testing enabled investigation of the side hull beam-to-depth ration, and analysis of the longitudinal location of the side hulls. The testing correlated with the 1:35 tank test results. In July 1998 this manned model was subjected to open water towing tested in order to benchmark the full scale resistance of the concept vessel developed to date. Testing also investigated the resistance of the model with and without foils. The tests were conducted by AMC using their portable being towed over a distance of 2000 metres in the sheltered waters of North West Bay, Tasmania. 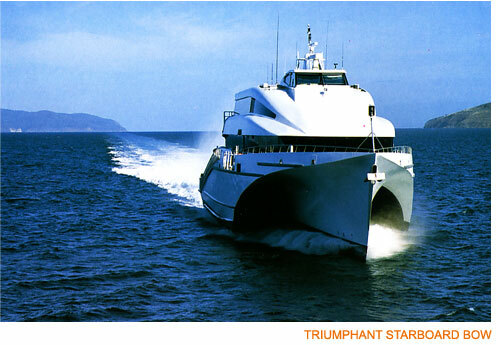 After two years of research, NWBS had sufficient confidence in the trimaran concept to start design and construction of a stock vessel, the 55m, 40 knot trimaran fast ferry MVTriumphant. Construction commenced in December 1999, and continued throughout 2000, leading up to launch in March 2001. 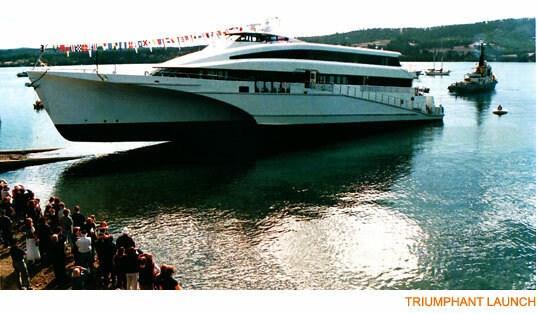 Comprehensive sea trials were conducted during June 2001. These trials culminated in a sea keeping trial on 25 June conducted in conjunction with the Australian Defence Science and Technology Organisation (DSTO). The trimaran was instrumented with a wave height sensor, motion sensor and accelerometers and trailed off the southern coast of Tasmania. Weather conditions on the day of the trial were particularly adverse with winds of 40 to 50 knots and significant wave heights reaching 4.7m. Trial runs were performed at 25 and 40 knots. 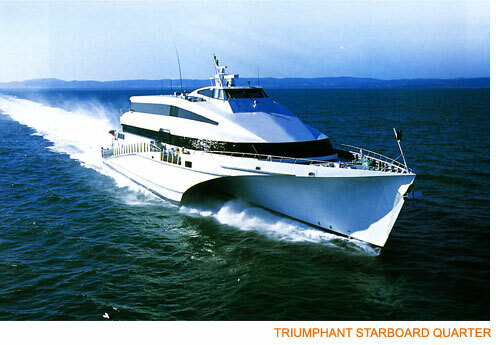 MV Triumphant maintained a speed of 36 knots into a 4.7m significant head sea (simply not achievable with a comparable mono-hull or catamaran due to bow slamming). At no stage did the vessel slam, and no water was taken across the foredeck. Accelerations at the centre of the passenger cabin were less than 0.14g (measured to one standard deviation). In 2001 she was renamed Dolphin Ulsan and was put into commercial service running daily return crossings of the Korean strait between Kita Kyushu in Japan and Ulsan in South Korea.